Live from Surrey City Hall! Sometimes it starts as a quiet rumble. Sometimes, it’s as powerful as a lightning strike. Other times, it’s the voice of someone telling you their story, inspiring you with their words to discover, change, and grow. On April 6th, 2019 at TEDxBearCreekPark, the first TEDx event in Surrey, thirteen voices from the community are coming together, unified by the power of a Shift in Thinking, to inspire and support the growth of ideas in Surrey. The Streaming Service (the "Service") offered through the Site, is made available by Yare Media Group Inc. ("Yare") in cooperation with TEDxBearCreekPark. Yare provides streaming platform services that enable content providers to deliver audio visual sports and entertainment content over the internet to certain internet connected devices such as PCs, mobile phones, tables connected TVs and other devices. 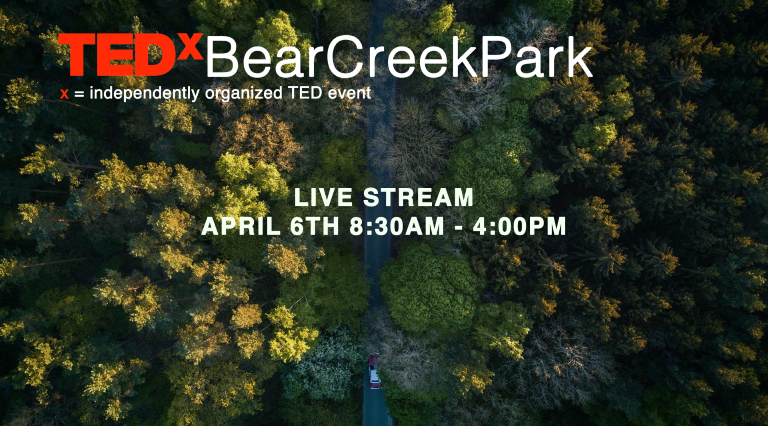 The Service enables website visitors to view live streaming of the TEDxBearCreekPark event being held live on April 6, 2019 at Surrey City Hall. To access the events offered within the Service, the user must create an account. You are responsible for all hardware, software and internet connectivity necessary to access the Services. We will use reasonable measures to ensure that the Service is available at all times, however, the Service is provided on an "as is" basis. The quality of the display of the streaming of the event may vary from computer to computer, and device to device, and may be affected by a variety of factors, such as your location, the bandwidth available through and/or speed of your Internet connection. At certain venues the video and technical requirements associated with producing the streams may be provided by student or volunteer personnel. We will not have any liability to you for the cancellation or abandonment of any event or the failure to show an event as scheduled, nor in the circumstance where you are unable to watch any event on a specific platform device. The Services and the Content are for your personal, non-commercial use, entertainment and enjoyment. You may not reproduce, duplicate, copy, translate, broadcast, publicly display, sell, transmit, retransmit, license, sub-license, publish or modify any of the Services or the Content without the prior written consent of Yare and TEDxBearCreekPark. Yare and TEDxBearCreekPark reserve the right to terminate your access to the Site and Service at any time and for any reason where Yare has determined, in its sole discretion, that use of the Service by you is, or was in breach of the Terms of Service. Any such termination by Yare shall be in addition to and without prejudice to such rights and remedies as may be available to Yare, including injunction and other equitable remedies. The disclaimer, limitations on liability, and indemnity provisions shall survive termination or expiry of your order and this Agreement. YOU EXPRESSLY UNDERSTAND AND AGREE THAT EACH OF YARE AND TEDXBEARCREEKPARK, THEIR AGENTS, REPRESENTATIVES AND LICENSORS AND EACH OF THEIR RESPECTIVE AFFILIATES (COLLECTIVELY THE "EVENT PROVIDER") DO NOT MAKE ANY, AND HEREBY DISCLAIMS ALL, REPRESENTATIONS, WARRANTIES, TERMS, CONDITIONS AND ENDORSEMENTS (COLLECTIVELY THE "WARRANTIES") OF ANY KIND, WHETHER EXPRESS OR IMPLIED, AS TO ANY MATTER HEREUNDER, INCLUDING WITHOUT LIMITATION, ANY IMPLIED WARRANTIES OF MERCHANTABILITY, FITNESS FOR A PARTICULAR PURPOSE, NON-INFRINGEMENT, TITLE, ACCURACY, SUITABILITY, RELIABILITY, FREEDOM FROM INFECTIONS OR VIRUSES OR COMPLETENESS AS WELL AS ANY WARRANTIES ARISING BY STATUTE OR OTHERWISE IN LAW OR FROM A COURSE OF DEALING OR USAGE OF TRADE. FURTHER, THE EVENT PROVIDER DOES NOT WARRANT THAT THE SITE, THE SERVICES OR THE CONTENT WILL CONTINUE TO OPERATE OR OTHERWISE OPERATE WITHOUT INTERRUPTION OR OTHERWISE IN A TIMELY, SECURE OR ERROR-FREE MANNER OR THAT SAME WILL MEET YOUR REQUIREMENTS OR EXPECTATIONS. LIMITATION OF LIABILITY: YOU EXPRESSLY UNDERSTAND AND AGREE THAT IN NO EVENT SHALL YARE AND TEDXBEARCREEKPARK (INCLUDING EACH OF THEIR RESPECTIVE OFFICERS, DIRECTORS, EMPLOYEES AND AGENTS) BE RESPONSIBLE OR LIABLE TO YOU OR ANYONE ELSE (JOINTLY OR SEVERALLY) FOR ANY CLAIM, LOSS OR DAMAGES WHATSOEVER, INCLUDING WITHOUT LIMITATION ANY DIRECT, INDIRECT, INCIDENTAL, CONSEQUENTIAL, SPECIAL OR EXEMPLARY DAMAGES OR ANY DAMAGES FOR LOSS OF INFORMATION OR DATA, PROFITS, SAVINGS, REVENUE, GOODWILL OR OTHER INTANGIBLE LOSSES ARISING FROM, OR IN ANY WAY CONNECTED WITH THE SITE, THE SERVICES OR ANY OF THE CONTENT (INCLUDING THE PERFORMANCE, USE OF, OR ACCESS TO, OR THE INABILITY TO USE OR ACCESS SAME), REGARDLESS OF WHETHER THE EVENT PROVIDER HAD BEEN ADVISED OF OR COULD HAVE FORESEEN THE POSSIBILITY OF SUCH CLAIM, DAMAGE OR LOSS. THE LIMITATIONS OF LIABILITY AND DISCLAIMERS HEREIN SHALL APPLY REGARDLESS OF THE FORM OF ACTION, WHETHER IN CONTRACT, BREACH OF WARRANTY, CIVIL LIABILITY, STRICT LIABILITY, TORT (INCLUDING NEGLIGENCE), OR OTHERWISE. NOTWITHSTANDING THE FOREGOING, IN NO EVENT SHALL YARE AND TEDXBEARCREEKPARK'S AGGREGATE LIABILITY TO YOU EXCEED THE AMOUNT PAID TO YARE AND TEDXBEARCREEKPARK BY YOU FOR THE SERVICE. CERTAIN SERVICES ARE PROVIDED THROUGH NETWORKS AND FACILITIES, INCLUDING THE PUBLIC TELEPHONE NETWORK, THAT ARE NOT UNDER THE CONTROL OF YARE AND TEDXBEARCREEKPARK. WITHOUT LIMITING THE GENERALITY OF THE FOREGOING, UNDER NO CIRCUMSTANCES SHALL THE EVENT PROVIDER BE HELD LIABLE FOR ANY DELAY OR FAILURE IN PERFORMANCE OF THE SITE, SERVICES OR CONTENT RESULTING DIRECTLY OR INDIRECTLY FROM ACTS OF NATURE, FORCES, OR CAUSES BEYOND ITS REASONABLE CONTROL, INCLUDING, WITHOUT LIMITATION, INTERNET FAILURES, DENIAL OF SERVICE ATTACKS, COMPUTER EQUIPMENT FAILURES, TELECOMMUNICATION EQUIPMENT FAILURES, OTHER EQUIPMENT FAILURES, ELECTRICAL POWER FAILURES, STRIKES, LABOUR DISPUTES, RIOTS, INSURRECTIONS, CIVIL DISTURBANCES, SHORTAGES OF LABOUR OR MATERIALS, FIRES, FLOODS, STORMS, EXPLOSIONS, ACTS OF GOD, WAR, GOVERNMENTAL ACTIONS AND ORDERS OF DOMESTIC OR FOREIGN COURTS OR TRIBUNALS. You acknowledge and agree that the Services may be temporarily unavailable as a result of disruptions as described above. While Yare and TEDxBearCreekPark make every reasonable effort to minimize such downtime, Yare and TEDxBearCreekPark cannot guarantee the 100% availability of the Services. Accordingly, if you are dissatisfied with the Services for any reason, your sole and exclusive remedy is to discontinue use of the Services in accordance with these Terms of Service. You expressly acknowledge that Yare and TEDxBearCreekPark have set the Charges for the Services, entered into this Agreement, and have and will make the Services available to you in reliance upon the limitations and exclusions of liability and the disclaimers set forth herein, and that the same form an essential basis of the bargain between you and Yare and TEDxBearCreekPark. You expressly agree that the limitations and exclusions of liability and the disclaimers set forth herein will survive, and continue to apply in the case of, a fundamental breach or breaches, the failure of essential purpose of contract, the failure of any exclusive remedy or termination of this Agreement. You agree to defend, indemnify and hold harmless each of Yare and TEDxBearCreekPark, their affiliates, licensors, co-branders and other partners, and each of their respective officers, directors, employees and agents, including all third parties mentioned on the Site, from and against any and all claims, actions or demands, including without limitation reasonable legal and accounting fees, alleging or resulting from: (a) your breach of any of the Terms of Service; (b) your access to or use of the Site or Services; (c) your use or reliance on, or publication, communication or distribution of anything on or from the Site; or (d) your violation of any law or regulation. This Agreement is personal to you, and you may not assign your rights or obligations to anyone. The Terms of Service constitute the entire agreement between Yare and you pertaining to your use of the Services and supersede any prior agreements between you and Yare. The parties have required that the Terms of Service and all documents relating thereto be drawn up in English. Google Analytics - this service tracks Website usage and provides information such as referring websites and user actions on the Website. Google Analytics may capture your IP address, but no other personal information is captured by Google Analytics. Streamlyzer - this service tracks video usage such as the number of times a video is accessed, how long it is played, aggregate usage and quality of service metrics.